Leonard Cohen, Grand Master of Melancholia, slipped quietly in and out of London last month – even CBS, his record company, had difficulty tracking him down – and left behind his intention to quit with the music business. As displayed in his albums, Cohen is a man of many moods – and CBS, at least, are taking his announcement with a cool attitude of wait and see. Meanwhile, a new Cohen album, completed during his British visit; is expected shortly. Alistair Pirrie spoke to Leonard Cohen for NME. If Leonard Cohen sticks to his announced decision to quit the music business; it will come as no surprise to those who know him well. Among friends, he would often claim that he hated the business of selling his songs to people, and he hated the society that made this necessary. One night recently he told me why he wanted to quit. “I’m no longer a free man; I’m an exploited man. Once, long ago, my songs were not sold; they found their way to people anyway. He paused and took a sip of his wine. “There is much to regret in the system of placing songs at the disposal of others. Cohen was born 35 years ago in Montreal, Canada. He started off his career studying arts at McGill University though later, interested in business, he switched to commerce. Later still he tried law at Columbia University in New York and, on leaving, took a job in the family clothing factory. He had started writing at the age of 14 – mostly prayers and poems to get women. Not long after he started in the family business, his first book of poems was published, and any plans he had to run the factory were forgotten. At the end of the fifties Cohen took off with a woman called Marianne and lived in virtual isolation on the Greek island of Hydra for nearly eight years. When he left, he suffered a nervous breakdown and it was soon after this that he started putting his poetry to music. He says that he has no concept of religion in his life but, strangely enough, he sings a song about Joan of Arc on his last LP Songs of Love and Hate. Cohen is a dark, sad man, and, at times, his deep, dead-pan voice falters into a brooding silence. He doesn’t like Lennon-type protest songs. “I don’t programme the songs I write,” he told me, “I just write what comes. “If my passion was involved in those daily issues I would write about them. Anyway, I half feel that my songs do protest in their own way. All of his songs and poems are about people and situations which have come into his life. “Suzanne” on his first LP, Songs of Leonard Cohen, is a description of a spent with a girl of that name. It really did happen, and she did feed him tea and oranges that came all the way from China. Another of his songs from that same LP was written when he was in Alberta and met two girls in a cafe. Although Cohen -was always dissatisfied with the record business, he didn’t feel he was working in a void which isolated him from new experiences. “It’s been my experience that there is no situation which is artificial. There are responses which are artificial or untrue. “The song is so important to me. It’s that one verse where I say that I swear by this song, and by all that I have done wrong, I’ll make it all up to thee. 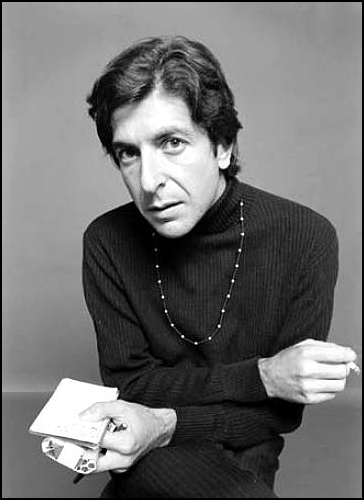 Cohen became more and more dissatisfied with each LP he produced, culminating in almost dejection over his last record Songs of’ Love and Hate. During my last conversation with him, Cohen had changed. He smoked my cigarettes almost continuously and appeared much more withdrawn, answering questions vaguely and lapsing into silences much more frequently. In his song “Bird on a Wire” there is a line in which he says “I have tried in my way to be free”. Perhaps he feels that this latest move will mean a new chance for him to be free. I think for a man as self-explorative as Leonard Cohen, freedom is a great deal further away.